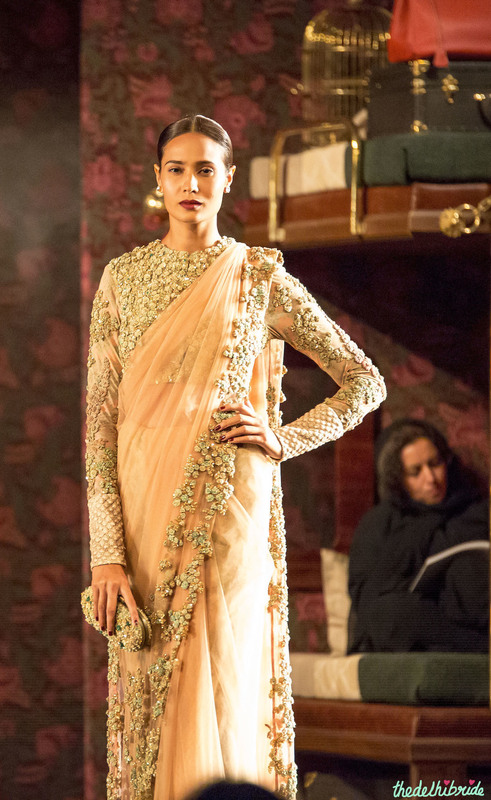 How I wish I could use those words to describe the Sabyasachi show. Unfortunately, all I got was a glimpse, and a strained one at that. The show was set up in a way that the audience was seated on a single level – disastrous for a fashion show, because bobbing heads block you from viewing the lower half of all outfits. You see only half the grandeur. As do the photographers. To top off the miserable view, the models didn’t pause center-stage to allow you a moment of appreciation. They stopped at the far ends, further ensuring that even a strained neck got you nowhere. Unless you were in the front 2 rows, you wasted your time at this show. 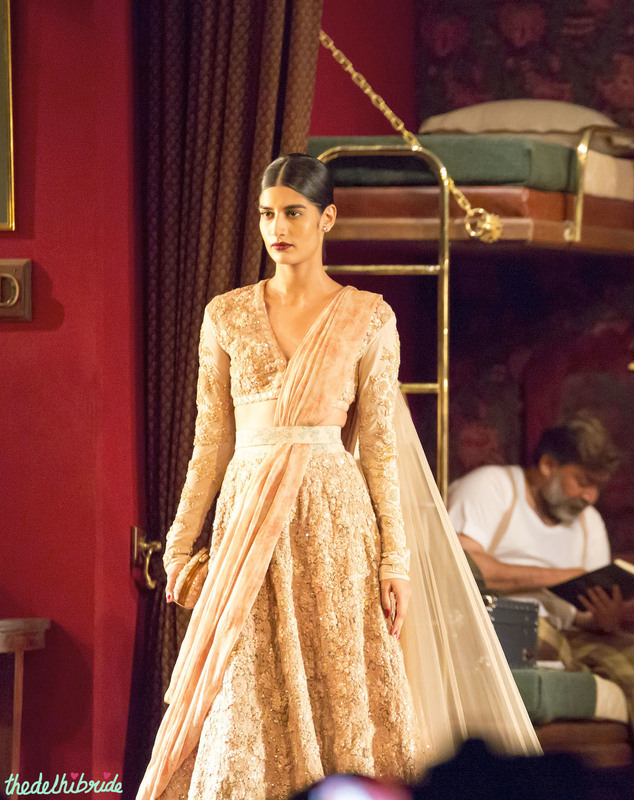 Which was unbearable, considering this was my first Sabyasachi show viewing. And I had seen his creations only once earlier – at the Vogue Wedding Show last year. I was beyond excited to attend a live-viewing of his latest couture collection, but now all I have are a few salvaged photographs. And I’m left to opine based on digital images and a half-glimpse of some outfits. Before I reached home that night, I was sure I wouldn’t do a whole post on the Sabysachi show. But then as I flicked through the pictures, the garments did the talking. And suddenly, there was enough to talk to you about. There was enough for a bride to want to know about. 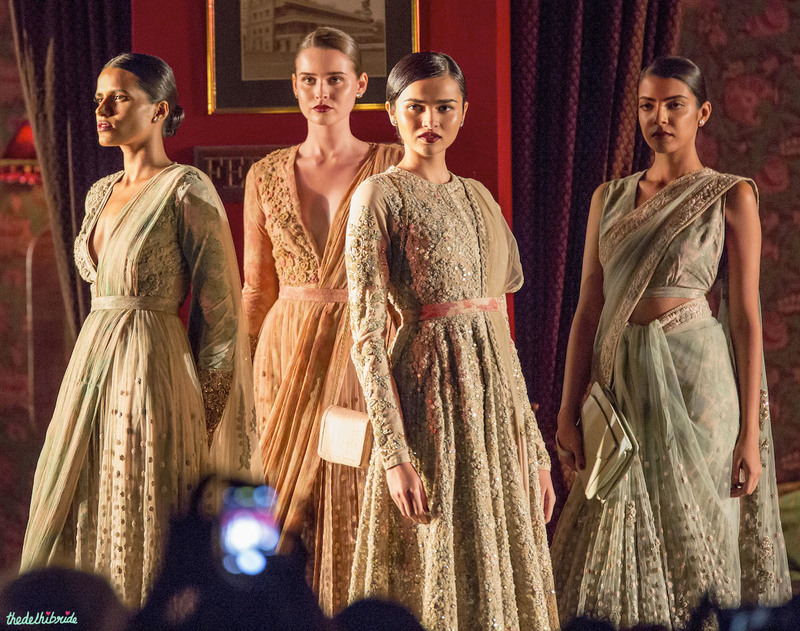 So here I am, doing the thing I said I wouldn’t – a post entirely dedicated to Sabyasachi’s show at Shree Raj Mahal Jewellers India Couture Week 2014. This black velvet lehenga with vintage muslim zardozi embroidery, is black. So most of you won’t wear it. But this one’s for those who don’t care about wearing a black or white garment on their wedding functions (I know you brides exist!) It’s insanely gorgeous, isn’t it? Where to wear? With a different blouse & dupatta (the ones in the picture are quite un-bridal), you can wear it to your Reception. Or as is, to your best friend’s winter wedding in Delhi – that’s a pashmina shawl draped on her arms. This one looked so beautiful, even from a distance. 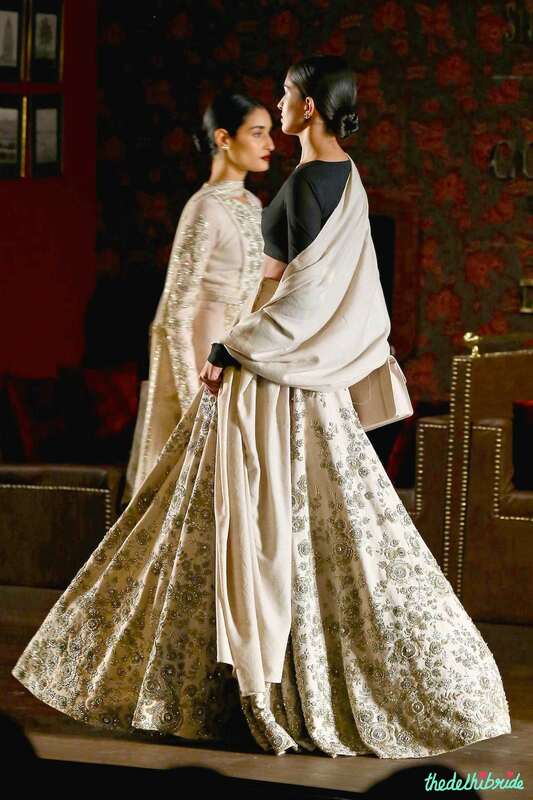 It looks like a lehenga made from a buttery-soft material (it’s actually canvas) and just screams elegant luxury. Where to wear? 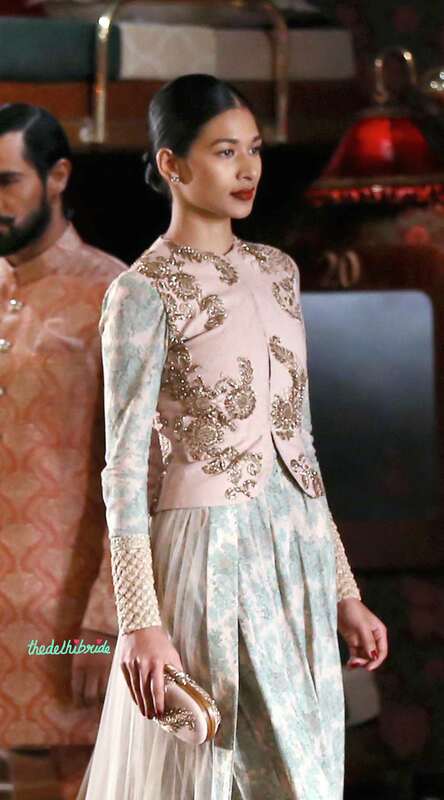 Pair it with a different blouse and dupatta – pastel shades to make it apt for your Reception. The tiny-flowers embroidered all over the border in duck egg blue and other pastel shades demand my attention. 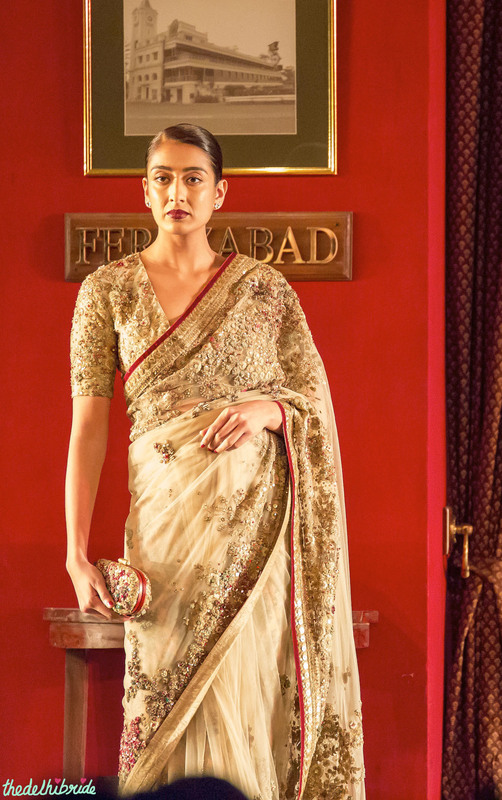 And matching a heavily embellished blouse with a plain sari that has a heavy border to create a sense of balance. Spells perfection, wouldn’t you say? Add to that – the amount of thought that has gone into this sari. The vintage pattern petticoat and layer underneath the blouse allow for an additional layer of design to peek through. The close-to-neck collar on the blouse removing the need for a necklace, and the separate cuff details removing the need for bangles and bracelets. You carry this sari for an out-of-town wedding, and it’s the only piece thing you’ll need to carry. Where to wear? Anywhere. As part of your wedding trousseau, wear to someone’s wedding, your own Reception. It. just. works. The beauty of this sari is lost in the image. Also, blame the blouse. Click on the image to see a bigger version, and just take it in from the velvet pink drape all the way to the duck egg blue tulle pleats. It’s an absolute beauty. I would kill to own this. Where to wear? Attend a day wedding in the winter in this. Pair with a blouse in deeper shade of light blue or pink – ideally in raw silk. Bam! Look like a royal. This is me acknowledging that the quality of pictures for this outfit is not great. But still, just imagine a clearer image. Now repeat after me – pretty, pretty, pretty. Right? 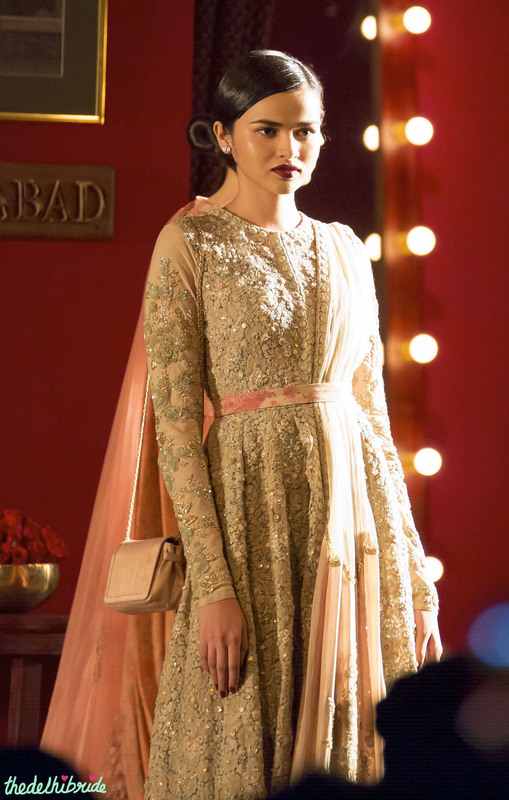 Who wouldn’t want this vintage romantic look in their wedding trousseau! Where to wear? As a wedding guest – to any event (if you’re attending a wedding in this though – make sure it’s during the day). Or to any formal party as a newlywed. I don’t have images of the whole collection, so what I did was – I picked out the best from the pictures I did have. Notice the floral belts! What a lovely way to drape a dupatta with an anarkali. I’ve not lost my mind. 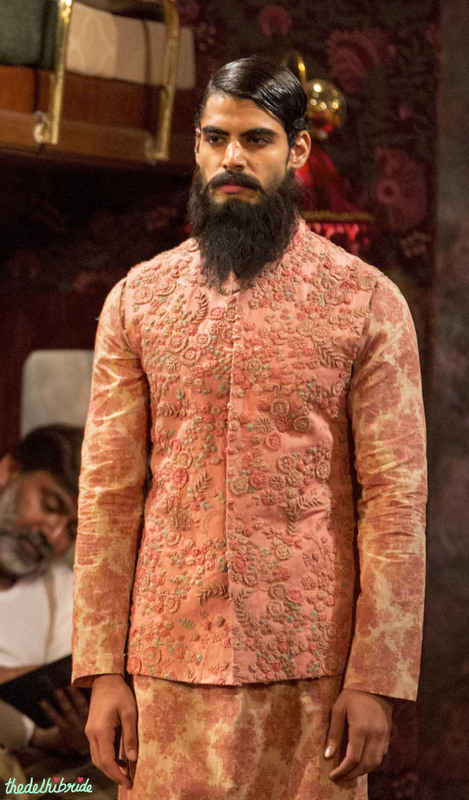 The floral Nehru jackets, with a plain kurta underneath – that would work, right? Photo credits: Ashutosh Chaudhary and Gulshan Sachdeva, without whom this post wouldn’t be possible! 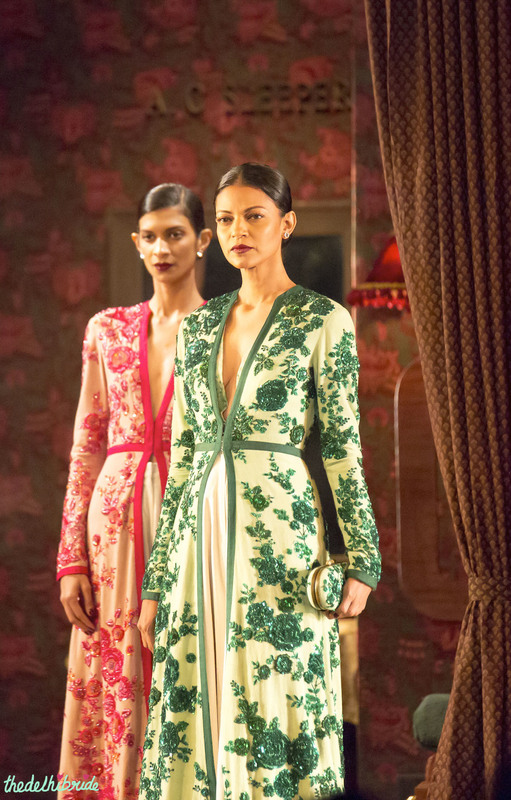 If you’re thinking you can walk into Sabyasachi’s Carma store at Mehrauli and have a look at these clothes in person, you’re wrong. 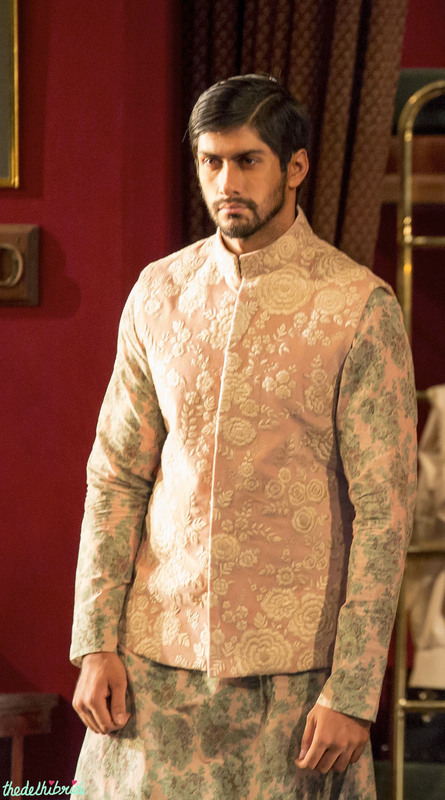 I visited just last week with a friend who was looking for her wedding lehenga, and was told we need to book an appointment to view and buy the couture collection. 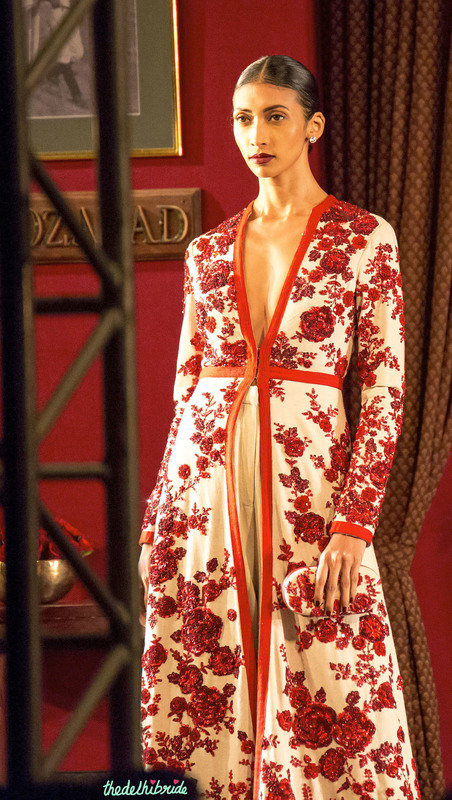 What’s your favourite piece from Sabyasachi’s India Couture Week show? Very nice collection of Sabyasach and i love it. wow! loved the saree collection more than anything 😀 . Welcome back! 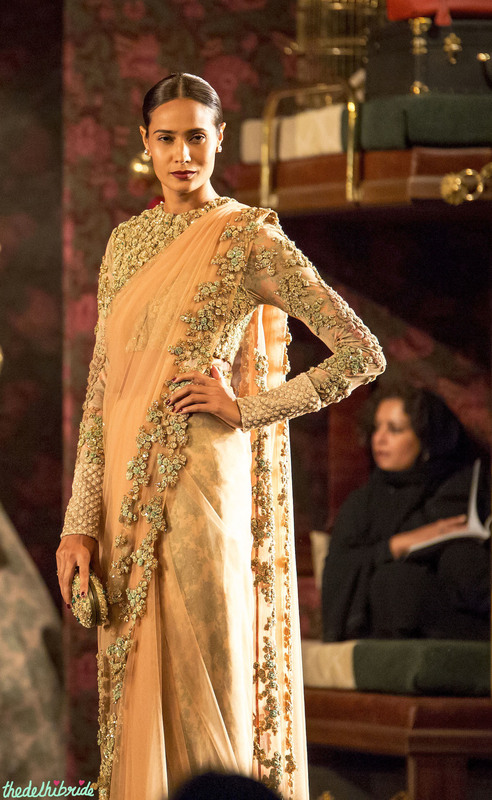 Love the first velvet lehenga, absolutely gorgeous! And the collection and the pictures are great! The collection is beyond words..Its Too good !! Loved this detailed post – the pictures look great and you can really see the equisite nature of Sabya’s work. Thanks for the tip at the end about making an appointment to view this collection in person!